Mining is a skill that allows players to obtain ores and gems from rocks found throughout the world. These materials can either be sold for profit or used for other skills such as Crafting and Smithing - it links into Smithing quite well as you would expect. Mining as a skill is odd due to the fact that its potential for profit peaks at level 30 from the ability to mine Pure Essence (after Rune Mysteries), everything you can mine after that is weaker in comparison to getting a lot of Pess if you're simply after money (or looking to Runecraft a lot of course). If you're looking to level Smithing alongside Mining, however, you will level a lot faster in comparison to only doing Pure Essence at the cost of worse profitability, and because this is a guide for 99ing the skill that's exactly what'll be written in the Training section. Have a pickaxe equipped or in the inventory of which you have the mining level to use. Higher tiers are better to mine faster. Have the minimum required mining level for the rock you're trying to mine. Higher is better to mine it faster. Find a rock which you can mine. Click on it. Simple. A common mining technique is known as Powermining - this is simply dropping your ores as you mine them rather than bank them to sell or smith later. Obviously this emphasizes pure mining gains, so keep it in mind if you want 99 mining and nothing else. Otherwise, Powermining is less recommended. Buy all the pickaxes you'll be using from Nurmof in the northern section of the Dwarven Mines under Falador. Watch out for the level 14 scorpions if you're below a combat level of 29. It is highly recommended to get an Attack level of 40 (done easiest via the quests listed on the Beginner's Guide) if you don't have it already, as equipping your pickaxe while mining obviously frees up an inventory slot for slightly more efficient mining. There are no Black or Dragon pickaxes in /v/scape, the table isn't missing anything. These are most of the possible ores you can get from mining rocks throughout the world. Some of them are for quests only, and the best locations for the ones you'll be mining will be explained below in the Training section. As stated on the Differences page as well, the respawn times for some of them have been changed from Realscape because /v/scape has only 1 world/there is no worldhopping - changed respawn times are in bold. Also note that you have a very low random chance to obtain an uncut sapphire, emerald, ruby, or diamond when mining most rocks (NOT from Gem Rocks). The chances for a gem drop are increased when wearing any piece of charged Dragonstone jewelry (Combat Bracelet/Skills Necklace/Amulet of Glory only). The chance may also be slightly higher than normal with coal rocks, though this is unconfirmed. An ore not listed on the table is the Elemental Ore from the Elemental Workshop quest, because it gives no exp when mined despite requiring 20 Mining. It is recommended to complete all these quests before you start training, as they will boost you to 42 Mining altogether which gives the ability to mine most rocks and to use a Rune pickaxe quite easily. Otherwise, look below in the Training section. If you've done all the recommended quests in the above section's table and have beefed your levels up considerably, then scroll right down past the first section. You're going to at least want to Doric's Quest to get 15+ Mining (it brings you to level 16 from 1), otherwise you'll be leveling slower than you could be. Doric's Quest can be easily completed without mining anything too, if you acquire what you need from other players. Copper and Tin are near-useless ores and are basically just for leveling up right now. They can be found in the Lumbridge Swamp mine (south of Lumbridge Castle on the coast) or in the southeast Varrock mine (on the outer part of the southeast corner of the city), it doesn't really matter and you'll need to make multiple trips either way. You can either bank the Copper and Tin for some Smithing exp later or just Powermine and ignore them as 31 Copper+Tin ores are rather negligible. Start off with an Iron Pickaxe, then when you reach level 6 switch to your Steel Pickaxe. It takes 62 Copper/Tin to reach level 15. Recommended to get 31 of each and smelt them together into Bronze bars if you're banking the ores. Lumbridge Swamp mine, close to Lumbridge Castle. The southeast Varrock mine is slightly better for banking speed. Iron can become the majority of what people mine to get 99 as it is rather fast to acquire, but it is more recommended to not focus purely on it as you will miss out on Smithing experience and greater profitability. Instead you'll be mining it until level 60, why that number in particular is explained in the Conclusion section. Even if you're into Powermining, there's another, better rock to Powermine than Iron once you reach level 60. 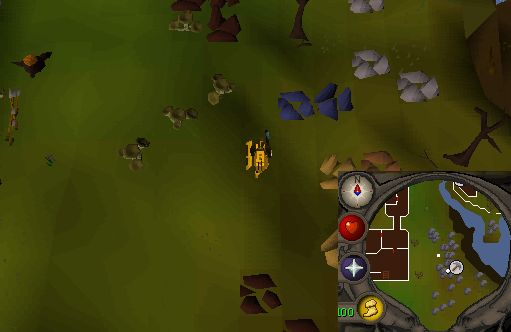 The best place to mine and bank iron is north of Yanille on the coast, south of Port Khazard. 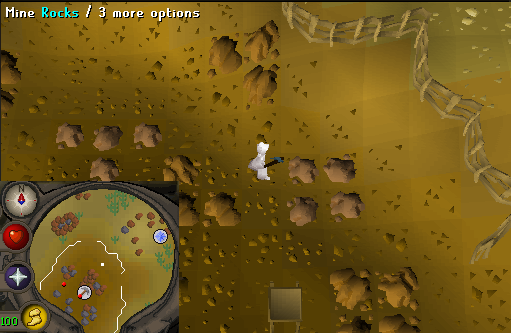 Simply run back and forth down to Yanille's bank from the mine when your inventory is full. 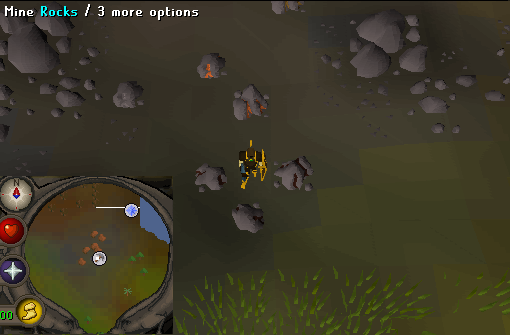 If you wish to Powermine instead, use a place where Iron rocks are clustered closer together such as the Al Kharid mine or Piscatoris mine, it doesn't matter if they're far from a bank as you'll be dropping the ores anyway with this method. Like stated in the intro of the guide, remember that Powermining is less recommended if you want to do more than just gain Mining levels. Once you reach level 21/31/41, switch to using your Mithril/Adamant/Rune pickaxes respectively. There is no greater tier of pickaxe than Rune, so unlike Woodcutting you do not have to invest a lot of money into the best tool for the skill. In order to reach level 60 from 15, you need to mine approximately 3,445 Iron ore. If you've done only Doric's quest and are at level 16 Mining, then ~3,436 Iron ore is needed for level 60. If you've done all the recommended quests for Mining exp and are at level 42 Mining, you only need to mine ~2,861 iron ore to reach level 60. Yanille's mine is best for banking iron. The Al Kharid is good for Powermining Iron. 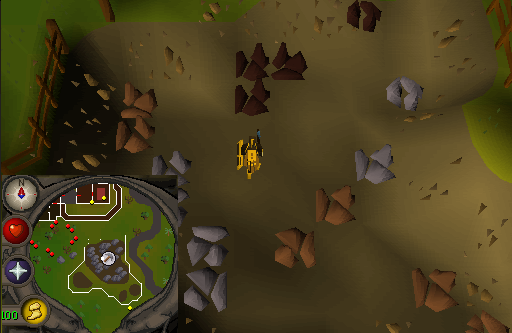 Watch out for the level 14 scorpions around the Al Kharid mine. and to see the map on the Fishing guide for how to get there. There are four possible routes you can take for 99 at this point. 60 is best to start them all at even though you can mine them as early as 30/40/40/45, this is explained in the Conclusion section. Mining Gold ore is arguably most recommended for those looking to eventually max all their skills, as achieving 99 Smithing is most easiest done via smelting Gold ore into Gold bars with the Goldsmith Gauntlets from the Family Crest quest - wearing the gauntlets increases the exp from smelting Gold ore to 126.45 exp per ore (from 50.625 per ore). On its own, however, mining Gold is slower Mining exp in comparison to Gem Rocks, Coal, and Granite. It also yields worse Smithing exp per hour than the most optimal method (using the Keldagrim ore vendor). Therefore, those looking for purely 99 Mining/those who don't care about Smithing very much should see below into the other sections. The best place to mine gold is in the Arzinian mine after the completion of the Between a Rock...! quest. It allows you to enter the mine with an abundance of gold ore to mine. This place is located in the Keldagrim mines east of Rellekka, north of the Mountain Camp. There is also a npc nearby who can send your gold ore to the bank at the cost of a few gold ore. The Golden Helmet is required for entering the gold mine. Equip any pickaxe (rune recommended) to mine the gold ore.
Equip the Ring of Charos (a). The Ring of Charos (a) allows you to cut down the shipping costs of your gold ore by 50% (the last dialogue option), which results to only 3 gold ore lost per inventory. So in total you will send 24 gold ore to your bank per trip. You can cheat this a bit and take 25 gold ore to your bank per trip by simply logging out and back into the game once at full inventory. You are kicked out of the mine upon relogging. Alternative ways to mine gold ore are in northwest/southwest Brimhaven and the Crafting guild, however these methods aren't recommended as it takes much longer to do a trip. The Shilo Village quest is required for banking efficiently using the cart service. The cart guy in Brimhaven is just south of the docks from Ardougne and his counterpart in Shilo Village is just west of the bank. It costs 10 gp per trip to use the carts, so keep a decent stack of coins with you while you mine your Gold. Alternatively you may bank in Ardougne by sailing there via the docks, but this is less recommended as it costs 30 gp each trip (or 0 with a Ring of Charos (a)) and the distance to bank is longer than it is in Shilo. Alternatively you may bank via the Castle Wars chest. With the inclusion of Construction, you can set your POH to Brimhaven to allow quick travel to the rocks and then simply warp to and bank at Castle Wars with an equipped ring of dueling. You'll want an abundance of dueling rings, 40 magic, the corresponding runes to cast Teleport to House back to Brimhaven, and money to set your POH to Brimhaven. Your run will basically boil down to: Teleport to House, exit and run to the rocks, teleport to CW at full inventory, bank and withdraw one Earth, Air, and Law rune, and repeat. There is also another method to filling your inventory with Gold ore that involves a group of 6 more Gold rocks south of the ring of 10, around the entrance to the Brimhaven dungeon. This is known as the Southern Six Rocks (SSR) method, and is done by simply mining 10 from the big ring, running down and mining 6, and then running back up to the big ring and filling up the rest. Tests done with this method seem to be much faster than simply waiting for Gold to respawn at the big ring, if you can put up with the extra clicking. Also watch out for level 32 Tribesmen near the dungeon entrance, they are aggressive to players under level 65 Combat and are able to inflict deadly poison which does 11 damage per tick. Another thing to keep in mind is the possibility to Superheat as you mine and wait for the rocks to respawn, if you're able to. This will save many many hours of extra time Smithing all the Gold ore you collect separately and therefore will certainly benefit in the long run. It's done by simply equipping a fire staff and keeping your pickaxe in the inventory, along with your stack of coins to go bank with, and also a large stack of Nature Runes to perform the Superheat spell. Don't forget your Goldsmith Gauntlets. The downside to this method is that you'll be losing a bit of money if you buy the runes or Pure Essence to craft them yourself, but Smithing is hardly ever profitable anyway and this method is obviously for focusing on levels over profits. You can also reliably Powermine by dropping the Gold after Superheating them into bars, as the bars have little use and this will certainly boost the slow gains of Mining and Smithing a little further. This means you won't have to keep coins on you to go bank either. Unlike Powermining for every other Mining material, it can be reliably recommended for Gold because you've already gained the non-Mining experience by turning the ore into bars. Gold runs start and end at the Shilo village bank. Tests were conducted with 89 Mining. Take each result with a grain of salt due to the fact that the rate at which you mine ores is random. One 25-gold ore run took approximately 4 minutes, minutes 54 seconds, or rounded to about 5 minutes per run. One 25-gold ore run with the SSR method took approximately 4 minutes 5 seconds, or rounded to about 4 minutes per run. 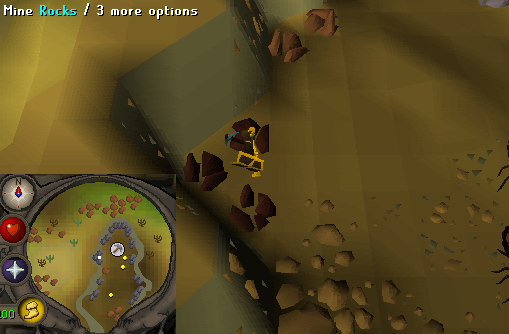 Each Gold ore mined gives 146.25 Mining experience. From level 60, you'll need approximately 87,253 Gold ores to reach level 99. Coal is quite useful for those looking to make hefty profits via Mining, whether through Smithing Steel/Mithril/Adamant/Rune items or simply selling it to other players. However, Coal is a bit of an odd-one-out compared to the other methods on this guide - Gold is for both Mining and Smithing levels, Gem Rocks are for both Mining and Crafting levels, and Granite is for pure Mining - Coal is also for Mining and Smithing levels but at a worse rate than Gold, because you'll need to gather other ores (with slow Mining experience rates) to smelt anything using it. 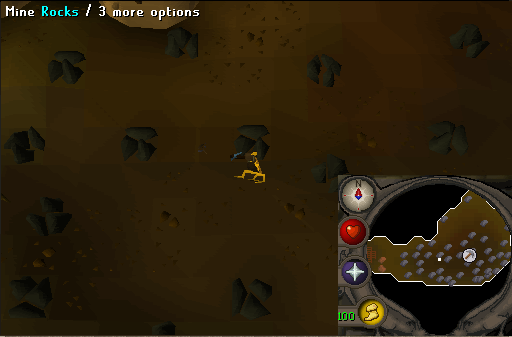 The best place to mine Coal is in the Mining Guild section of the Dwarven Mines under Falador. There are 27 rocks which makes for easy pickings even if another player is around. The Mining Guild requires 60 Mining to get in, so thankfully you leveled up that much before attempting to mine it. The Guild can be quickly entered down a group of 4 ladders which are in a plaza just south of the eastern Falador bank. There's also the Coal Trucks west of Seers' Village, but they're much, much worse than the Guild so always ignore them if you want to mine Coal seriously. Each Coal mined gives 112.5 Mining experience. From level 60, you'll need to mine approximately 113,429 Coal to reach level 99. Gem Rocks are quite useful for those looking to level Crafting via Mining. 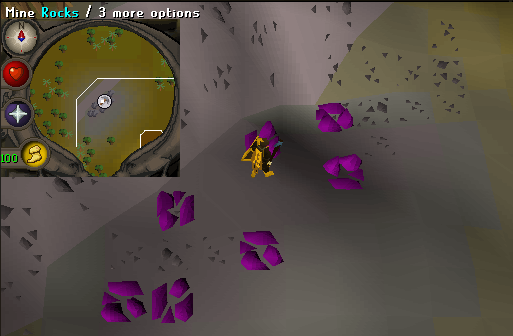 While Thieving is the best way to level Crafting, Mining Gem Rocks is the next best thing - they offer Rogue's Den-tier gem yields with some of the best possible Mining experience per hour. The best and only location for Gem Rocks is in Shilo Village, which of course requires the completion of the Shilo Village quest to enter. The main advantage of mining Gem Rocks is a better exp rate over Gold ore (as both grant the same exp per ore, but Gem Rocks respawn twice as fast), and also the potential for greater profitability if you sell your materials to other players. However due to the fact that the gems you get are randomized, it is unlikely that you'll get a lot of the best gems (Sapphires/Emeralds/Rubies/Diamonds) to overtake the profitability of Gold ore or Coal. The Gem Rocks are located in the northwest corner of Shilo Village. Yields include uncut versions of the following gems: Red Topaz, Opal, Jade, Sapphire, Emerald, Ruby, and Diamond. You're going to want to bring a chisel with you and have at least 43 Crafting to cut all your gems as you mine them. See the "What To Do With Your Materials" part of the Conclusion section for what to afterwards. Each Gem mined gives 146.25 Mining experience. From level 60, you'll need approximately 87,253 Gems mined to reach level 99 - same as Gold ores. Granite is a unique type of rock that gives a random size of ore (or rock, rather), with a corresponding amount of experience from each chunk. 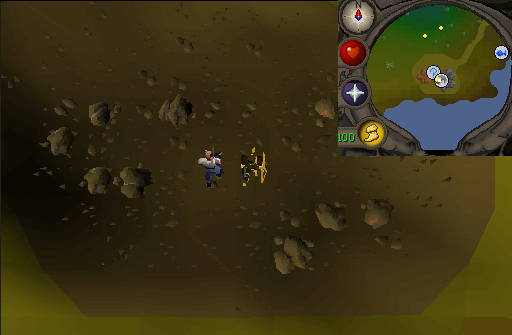 When Powermining Granite (as there is no current use at all for the rocks), you get the best Mining experience rate in the game. Look no further if all you want is to 99 your Mining. Wear a full set of Desert Robes (buy them from Shantay at the Shantay Pass in Al Kharid), and don't keep anything else equipped aside from your pickaxe as extra weight will cause the desert heat effect to tick faster. Keep a good few waterskins (again buy filled ones from Shantay) on you at all times. Teleport ::home and use the fountains there, then simply run back. Teleport to Al Kharid (keep a Ring of Dueling equipped for this if so) and use the fountain in front of the palace, then simply run back. Don't teleport but instead run far east to Pollnivneach where there is a water source available, then simply run back. This is less recommended for Ironmen or players with low HP whom might succumb to the desert heat and die quickly without any waterskins. A Regen Bracelet is also highly useful to use to help prolong your trips slightly more and make things safer for you. It's also recommended to mine the nearby Sandstone rocks as you wait for the Granite to respawn. They have the same small/medium/large chunk mechanic, but with less exp because they're a lower-level rock, and they have an extra-small chunk variant not present with Granite. Enjoy those fast Mining gains either way. Unfortunately because the chunk sizes and therefore the experience you get are random, gauging the amount of rocks you'll have to mine until 99 would be inaccurate - but Powermining Granite (with some Sandstone on the side) is without a doubt the fastest way to 99 Mining. Good luck! In conclusion, Mining is quite the slow skill that can be difficult to train. Its unpopularity is rather odd due to the fact that the majority of players level it to at least 30 for Pure Essence, but only a select few 99 it unlike other unpopular skills which most people just don't touch. Here's hoping this guide has helped you overcome the hurdle of training it! You're going to be Smithing all the ores you've collected and banked. If you're a Powerminermemer or would rather sell your ores for cash to other players, disregard this section. This is a great source of Smithing exp though so again, Powermining is not recommended. The best place to smelt ores is in Port Phasmatys (with at least 64 Agility or Priest in Peril completed to get there, 10 Ectotokens to enter the Port if Ghosts Ahoy is not completed), second best is in Al Kharid if you don't meed those requirements. 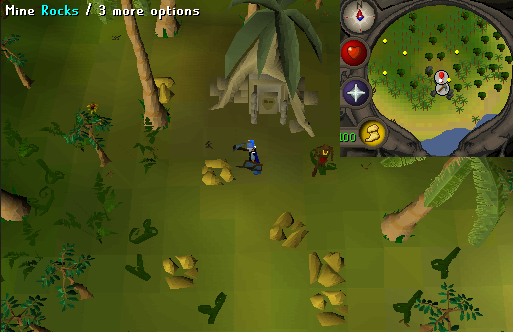 The best place to smith bars into various other objects is in Varrock, a shack with anvils in it is just a few steps south of the western bank. If you somehow forgot from Tutorial Island, Use a metal bar on an anvil with a hammer in your inventory to smith things. It is highly recommended to do The Knight's Sword quest, as it will level you up from 1 to 37 Smithing upon completion. This will allow you to smith at least all Bronze and Iron items to utilize the ores you got and not have to waste your time training Smithing more than you have to. The Knight's Sword can be easily completed without mining anything too, if you acquire what you need from other players. For the Bronze bars from levels 1-15, make Bronze knives with them. There's not much else you can do with Bronze and this will give you an unconventional head start from the norm on Ranged training; see the guide for what exactly to do with the knives. Each Bronze bar smelted from a Copper+Tin ore grants 14.0625 Smithing exp, so that's approx. 435.9375 experience from smelting all of them. Each Bronze bar that you smith grants 28.125 Smithing exp, so that's approx. 871.875 experience from smithing all of them. Combined with the exp from smelting, that's approx. 1,307.8125 Smithing experience total from Bronze. Each bar will give 5 knives, so that's 155 Bronze knives total. It's not much and they're weaker than Iron knives, so don't feel bad if you did quests to level past the need to mine Copper and Tin or make Bronze anyway. For the Iron bars from levels 15/16/42-60, making knives is most recommended just like with Bronze. Like also stated in the Ranged guide, Iron knives are the best low-level Ranged training weapon and only 1,000 bars/5,000 knives are needed to get your Ranged level to the point where you can use a Rune crossbow at 61. Remember that Iron bars have a 50% chance to fail smelting and destroy the ore unless you're Superheating or using a Ring of Forging (craft a lot yourself or buy from other players), and wasting a bar is detrimental for your own profits and Smithing experience so these are essential steps to take. Each Iron bar successfully smelted from an Iron ore grants 28.125 Smithing exp, so that's approx. 96,890.625 / 96,637.5 / 80,465.625 experience from smelting all of them depending on what level you mined the Iron from. Each Iron bar that you smith grants 56.25 Smithing exp, so that's approx. 193,781.25 / 193,275 / 160,931.25 experience depending on what level you mined the Iron from. Combined with the exp from smelting, that's approx. 290,671.875 / 289,912.5 / 241,396.875 Smithing experience total from Iron. Each bar will turn into 5 knives, so that's 17,225 / 17,180 / 14,305 knives total depending on what level you mined the Iron from. Note that either result will leave you with more Iron knives than needed for Ranged training (5,000), so either feel free to sell off the extra to other players needing Ranged weapons themselves, or once you have enough knives begin creating Iron platebodies instead - you get the same experience per bar smithed but Iron platebodies can be created much faster due to the fact that they take 5 bars at a time, therefore saving you time Smithing. Afterwards, simply sell the platebodies to a general store. Alternatively once you've smelted 1K iron bars to make knives with, wait until you can mine a lot of Coal quickly (see the levels 60-99 part of the Training section) and then use the rest of your Iron ore with 2x the Coal to make Steel bars with. The best thing to make with Steel bars are Cannonballs for profitability/personal ammo to use with the Dwarf Multicannon, or platebodies for better Smithing exp and smithing speed (make sure to get 48 Smithing for platebodies first, you'll probably get that high from the 5K Iron knives+The Knight's Sword exp). Cannonballs require the Dwarf Cannon quest's completion to be smithed, and they can only be made by using a Steel bar at a furnace with an Ammo Mould in the inventory. If you make Steel platebodies, either High Alch them for 1,200 gp each or sell to a general store like with Iron platebodies. Minus the Iron used for Iron bars, you'll have 2,445 / 2,436 /1,861 Iron ore leftover. This means you'll need 4,890 / 4,872 / 3,722 Coal depending on when you started mining Iron. Each Steel bar smelted from 1 Iron ore+2 Coal grants 40.5 Smithing exp, so that's approx. 99,022.5 / 98,658 / 75,370.5 experience from smelting all of them. Each Steel bar that you smith grants 84.375 exp, or 57.6 exp if you're making Cannonballs instead. That's approx. 206,296.875 / 205,537.5 / 157,021.875 Smithing exp, or 140,832 / 140,313.6 / 107,193.6 exp if you're doing Cannonballs - speaking of which you'll be getting 9,780 / 9,744 / 7,444 Cannonballs if you decide to smith them. Combined with the exp from smelting, the total Smithing experience from all your Steel will be approx. 305,319.375 / 304,195.5 / 232,392.375, OR if you make Cannonballs, it'll be approx. 239,854.5 / 238,971.6 / 182,564.1 exp. Make sure to have 40 Smithing to smelt Gold. The Knight's Sword's exp reward + the Iron smithing part up above should be easily enough to get there. As stated in the Gold mining section of the guide: Each Gold bar smelted grants 126.45 Smithing experience. All the bars smelted will add up to approximately 11,033,142 Smithing exp total if you got 99 Mining off of Gold ore.
As stated on the Crafting guide, Gold can then be made into amulets for some modest Crafting exp if you've decided to keep the bars. From all the Gold mined for 99 Mining, turning the bars into amulets will grant a total of about 5,889,578 Crafting experience. As stated in the Coal mining section and up in the Steel part of this section, Coal can be used with certain ores to create Steel/Mithril/Adamant/Runite bars which can then be made into various things if you have the Smithing level for them. See what's in demand and take smithing orders from other players when it comes to those bars, don't just make a stack of something that may be potentially unwanted/something that won't sell for a long time. It is highly recommended to utilize Gold bars with your cut gems for better Crafting experience than just making necklaces with Gold, if you did some mining of one or the other on the side. Also see the Crafting guide for what jewelry is recommended to make with each gem. "Why Mine Iron Immediately When Available? / Why Not Mine Everything Else Immediately When Available?" Unlike in guides such as Woodcutting or Fishing, Mining is more like Thieving in the sense that it's alright to immediately go for your next training target when available as the experience rates aren't that bad then - but ONLY for Iron. You still wait until 60 for Gold, Coal, etc, rather than doing them right when you're able to. 60 mining for Coal in particular is quite nice as that's right when you can enter the Mining Guild too, which is the best place to mine Coal. "Why Not Ever Mine Mithril/Adamantite/Runite?" While these ores may result in great profitability when smithed, they aren't important to this guide as while simply training Mining those ores are quite slow to acquire and therefore not good for experience - even with the lower adjusted respawn times.